So, since im getting back into the hobby, might as well get my original boat back operational. My plan is to run it direct, I believe the impeller is 30mm I've done some searching and found some images of others that have been converted... I'd like to make a better job. I think I'll try the 8XL's on 4s cheapo batteries for now with the AS26-150 and just be gentle with the throttle. Plan B; Install 2 'runners' - carbon square tube and mount the motor mount onto of this. Will need some couplings... and it to line up perfectly, I've seen some people using rubber couplings maybe this is a good idea...? very sleek boat, was this a kit you built? can i ski behind it? Why don't you just make the vertical part of the motor mount yourself? I did. I made it out of aluminum, works great. you could use the same motor mount plate. 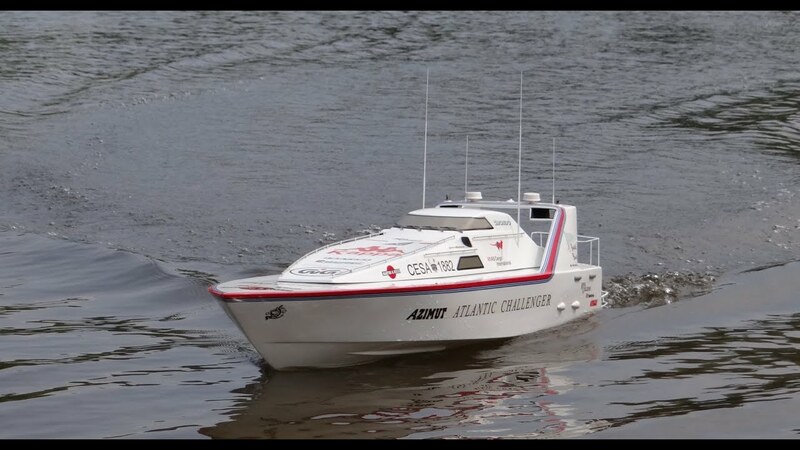 The Graupner Azimuth Challenger is a beautiful boat, do you know the stock setup ? Motors were 800BB Turbo, if you know the stock setup and the retio of the belt drive it' s easy to find the components for your Azimoth Challenger. Does anybody know if this is a custom setup or can I find soemthing like this online? And Alfa, I ran mine on 700BB turbo, this is a picture of my original setup from. a longggg time ago and a 12v Lead acid battery!!!! I guess if the date on the camera is correct... I've had the boat going on 13/14 years now... not looking too shabby! Now im running 'direct drive' and want to use some large capacity packs for longer run time I think an internal water-cooling system may be beneficial. I need 5mm to 5mm and something flexible to reduce vibrations. Nope, they are very weak and will sheer easily. Can I suggest for coupling motors to the shafts that you put a hex coupler on both the jet unit shafts and the motors and use a piece of flex in between, .150 or .187. That will sort the problem with vibration and a strong enough coupling system. You can get the couplers from OSE here. BTW, I wouldn't be shy about fitting a cooling system, if you can tap into the jet units then you will have plenty of cooling water, you can even take water from the bottom of the intake and feed it back in further up. Drilling and fitting a couple of outlets in the transom would be fine and hardly noticeable. I run a jet drive and do t have an issue with direct solid connection. Hi peter I did contemplate that, if it was only say 2” long I wouldn’t need any stuffing tube support would I? Ok I understand, the short flexi is your best option or a cv joint with dog bones. Yep about 2" should work. You can get the alignment pretty bang on by setting up with some solid shaft in the couplers to hold the motors straight in line and the fixing the motor mounts. Some urethane sealant/glue may be good for fixing the motor mounts, especially if they are a basic L shape. Just make small packers for height adjustment and fix in with the glue. If this is 'the mod' for the rest of the boats foreseeable life then a good permanent job is what you want to do. I am sure you will figure out a good way to do this. 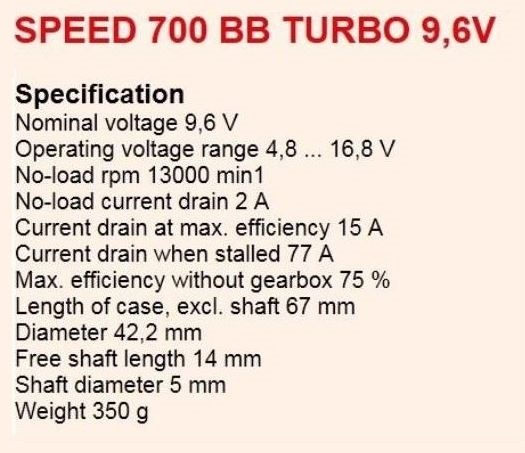 Here are Graupner 700BB Turbo specs. This is a 1350KV brushed motor. - What is the gearbox ratio ? Last edited by Alfa Spirit; 04-11-2019 at 07:59 AM. Hi, picture doesn't show up.. I think its a ~50% reduction, 11tooth on the motor, 25 on the shaft. I can't remember what cells I ran it on last time, I think I used 6s as that's what I had at the time... and I didn't run it flat out maybe 75% was enough.. I use these to connect some 9Xl's to straight shafts on one of my scale boats...work well.